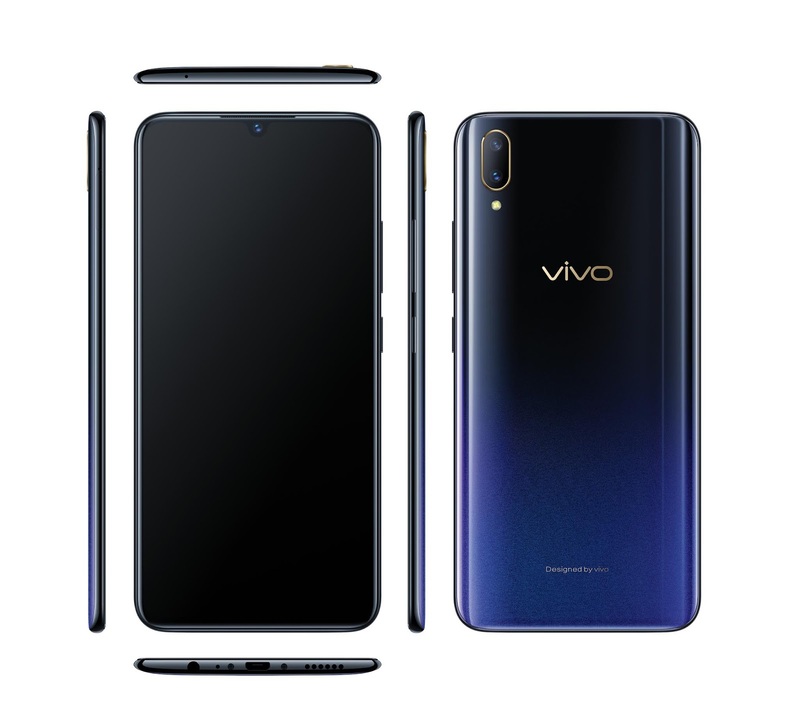 Vivo V11 Pro Launched - A Fancier Halo Notch upgrade to the Vivo X21. Vivo has been catching a lot of heat lately ever so slightly after the introduction of the In-Display fingerprint scanning mechanism. Right from the concepts of Vivo Apex to the reality in the form of Vivo X21 and Vivo Nex S, the company has progressed a lot in the process. 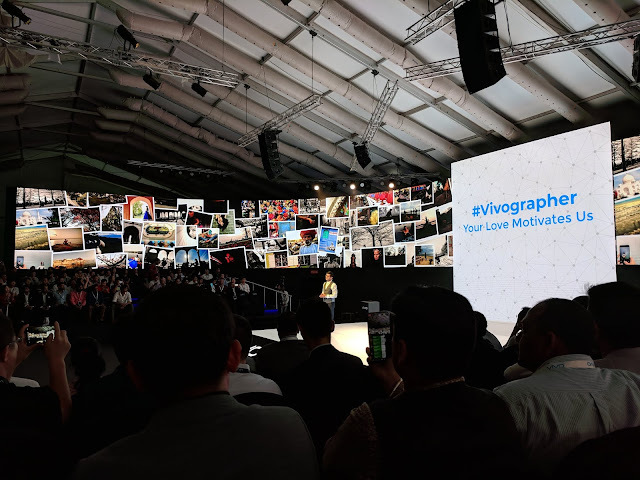 They managed to create vows in the mobile industry and fans have never been more excited about the recent launches. Right after progressing in the direction of a Motorized, Pop-up Front Camera module to the In-Display Fingerprint mechanism, Vivo is now introducing "Halo FullView Display" which is essentially introducing a cuter version of the not so fancy - "Notch." The internet called it the TearDrop/WaterDrop notch; however, it's getting termed as "Halo FullView Display" not so fancy name we guess. Let's find out more about the new Vivo V11 Pro regarding specifications, pricing, and availability. Although to the most part, the Vivo V11 Pro is merely a small upgrade to the Vivo X21. It houses a 2.2GHz Octa-core Qualcomm Snapdragon 660(4x2.2 GHz Kryo 260 & 4x1.8 GHz Kryo 260) chipset which is coupled with Adreno 512 GPU & 6GB RAM. The V11 Pro comes with 128GB. Whereas expansion is available up to 256GB via a MicroSD memory card slot(Dedicated Slot). It has 6.41-inch Full HD+(1080*2340) Super AMOLED panel which gives it about 402PPI pixel density. This design introduces a new type of Halo notch on the front, in turn, providing much more real estate to the user. It also comes with Corning Gorilla Glass 6 protection. The rear panel comes with a dual-lens camera setup with first a 12MP sensor having a F/1.8 aperture with Dual Pixel PDAF. While the second lens is a 5MP shooter with F/2.4 aperture. This configuration also includes a Dual LED Flash. While accompanying it is the Backlight HDR and Low Light photography modes for yielding better shots. Video can be shot at 2160p@30fps and 1080p@30fps. The front camera setup is a single lens setup which houses a 25MP shooter with F/2.0 aperture; it comes with AI Stickers features. It shoots maximum at 1080p@30fps. It supports Dual Nano SIMs(4G) having a hybrid slot setup. It runs on FunTouch OS 4.5 which is built on top of Android 8.1 Oreo. Regarding connectivity, it comes with 802.11 a/b/g/n/ac dual band WiFi, Bluetooth 5.0 LE, Radio FM support, 3.5mm audio jack & A-GPS. Concerning sensors there's the Proximity Sensor, Accelerometer, Compass and even an In-Display fingerprint sensor. It houses a non-removable Li-Ion 3400 mAh battery with support for fast VOOC charging(5V=4A), however via a MicroUSB 2.0 connection port. Though it's reversible, so that's a bonus. Comes in 2 different color variants - Starry Night & Dazzling Gold. The Vivo V11 Pro houses a poly fibre body which is a mixture of both metal and plastic. All in all, the device looks and feels premium, those radiant colors make it look overall appealing. Now it might attract fingerprints; however, the radiant color might be able to hide the smudges more efficiently. 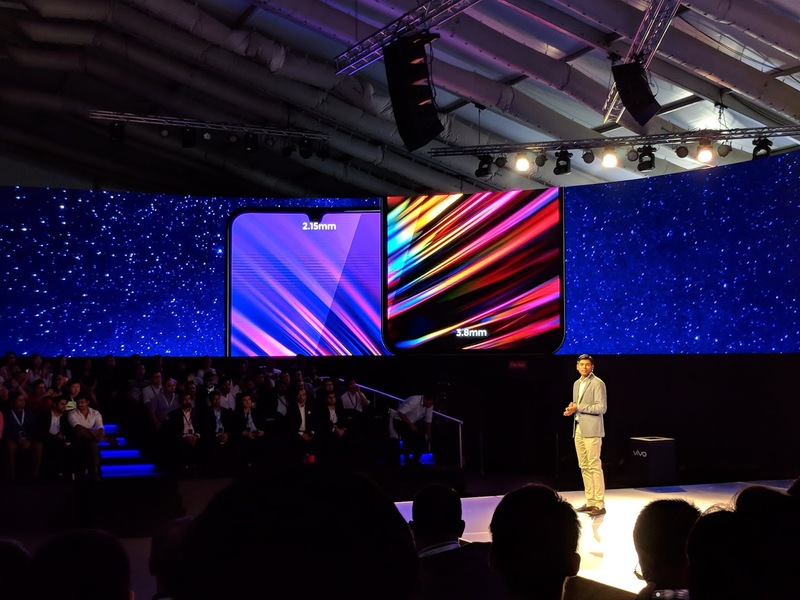 The idea of a smaller notch is quite exciting but at the same time, it gets spooky if you think about the Facial Recognition features though Vivo has quoted that it scans 1,024 facial feature points to unlock instantly, even in the dark. It's hard to judge that based upon our first look at the device here at the event. If we get the review unit, we would be sure to put the device through its paces to find out more on it in in-depth. However, as an exception, the V11 Pro marches ahead in the fast charging department which was earlier a disappointment in Vivo X21 due to the lack of Fast Charging speeds(Not support). Recently Oppo was the first to bring the Halo Notch to the mobile market segment with their new Oppo F9 Pro. However, the V11 Pro looks much more appealing concerning being value for money due to the In-Display fingerprint scanning mechanism. 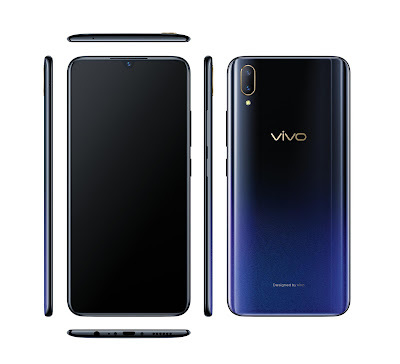 Vivo V11 Pro: 6GB/128GB ROM: Rs.25,990. Speaking about the availability, it'll be available in the offline market throughout the chain of Vivo's official & partner retail stores. While it'll be exclusively available on Flipkart starting from Sept 2018 itself. There are several offers as well beginning with Free Screen Replacement, Extra Rs.2000/- for HDFC Card users. etc. Do you think that the newly launched Vivo V11 Pro be able to compete with the recently announced Poco F1? Regarding cosmetics, the V11 Pro is our pick. However, we know that regarding specifications and benchmarks, the Poco F1 is the king. Would be compromising specifications for the aesthetics? I think we would. Stay tuned to our social channels for more coverage on the device, as our video will be live shortly on the YouTube channel.